With TV Satellite Systems Becoming Increasingly Popular With Motorhomers & Caravanners Alike. TC Motorhome & Caravan Centre Are Introducing A Range Of Mobile `Easy-Find` Digital TV Satellite Systems. The Easy-Find System Is A Unique Combination Of An LNB With Integrated Tri-Colour LED And Specially Programmed Satellite Decoder. This Ingenious System Uses A Simple `Traffic Light` System Which Enables Quick & Easy Location Of The Satellite Signal. Green – STOP ! .. Satellite Located .. EASY !! What it does- It makes locating the free-to-air satellite channels the simplest task ever! EASY-FIND is a combination of the unique LNB with integrated tri-colour LED and specially programmed satellite receiver. The Balaton Lake is certainly a lake of contrasting colours and moods depending on the time of day and the weather and we had seen some fantastic sunsets. We had several swims, though I don’t think ‘swim’ is the right word as it is hardly deep enough! You can walk out for a long way on the sandy bottom, sometimes knee-depth, then up to arm-pits then a few yards further out back to your knees! However, it is warm and very pleasant on a hot day. We also had a couple of days when it was so windy that there was almost more white foam than coloured water – that brought the sail-boarders out in profusion! There were very few people on the campsite which isn’t surprising as there are so many sites around the lake and it is still low-season – good for us with regard to the price and the special offer was stay for 4 nights and pay for 3 – we stayed for 8 so only paid for 6. Its worth checking the campsite books for offers and choosing a site accordingly. We left Siofok reluctantly as it had been a lovely time of relaxation where our pitch was big enough for us to have the option of sitting in the sun or the shade and we were able to see the lake. Our next stop was Budapest, only just over 60 miles further on but the best route is on the M7 motorway which entailed getting a vignette from a fuel station before going on the motorway. There was a Tesco with a fuel station very near the motorway junction so we were able to do a shop, then fill up with fuel and get the vignette when we finally found our way into the petrol station (going round the block a couple of times before going down a narrow entrance which looked as though it led nowhere). In Budapest we made our way to Haller Camping, a small but very convenient site in the city, a 2 minute walk to the tram stop (if we could climb over the fence it would only take about 30 seconds! ), and about 10 minutes to the Metro. We are doing a lot of traveling on public transport as it is free for over 65’s. Very useful and it gives us the chance to explore a lot of the city at leisure as we have given ourselves about 10 days here. This also the first site we have come across where there is no charge for using the washing machines. Internet is also free, but sometimes difficult to get on to if too many people try to use it at the same time. However, at €15 a night with ACSI card its good value. Since leaving Croatia we have seen many changes of scenery from the grey rugged mountains in the south to the meadows and arable land as we traveled further north. In some of the places inland we saw quite a lot of derelict and broken-down houses which we think may have been abandoned in the war a few years ago. There is, however, a lot of building work going on and the country is progressing in leaps and bounds and a new motorway is still being built which will eventually connect Split and Dubrovnik. This will speed the journey but it won’t be as attractive as going along the coast road or through some of the little villages, even though the road is narrow in places with a drop into the ditch if you are not careful! We made an overnight stop just north of the Plitvicka Lakes which are a UNESCO site and definitely worth visiting. We spent a day there 3 years ago and thought it was lovely – many waterfalls and lakes with the path in places being slatted wood with the water bubbling up though the slats. We made our way around Zagreb and to the Hungarian border where we had our passports checked at 2 kiosks and the customs asked to come into the van. The customs-man didn’t really look around very much and seemed to be checking on cigarettes and alcohol being taken into the country. We had to declare our 17 litres of Croatian wine bought in bulk to be taken back to England – don’t know if that was over the limit, but he let us go anyway, and smiled approvingly when we said we didn’t smoke so had no cigarettes. A little way passed the border we came to a market area with stalls selling clothes, shoes, table-cloths and anything else tourists or locals might like to buy. All at very good prices and priced in Kunas (Croatia), Forints (Hungary) and Euros. Trying to work out whether items are cheap or expensive takes a bit of thinking about as 1 Kuna is around 13 pence, and there are approximately 280 Forints to £1. At least the euro is used in most countries and you don’t have to try to use up odd bits of currency before leaving the country. We are now at a campsite about 5kms from Siofok on the shores of the Balaton Lake and have seen the water change through so many different colours – green in the sun, grey some of the time and nearly black in a thunder storm! The cycles are in use again as the area is flat and going into the town is an easy ride. Siofok is definitely a tourist place with dozens hotels, children’s amusement places, restaurants and souvenir stalls – more exploring to be done yet! Well we have spent almost three weeks at this site and will soon be moving on. A lot of time has been spent relaxing and enjoying the lovely view we have from our pitch. Public transport on the peninsular is almost non-existent but we did establish that there was a bus going to Dubrovnik, leaving Orebic at 7.20a.m. – we hadn’t seen any bus-stops and wondered if we would have to walk into the town to get on it, but we were assured that if we waved our arms at the driver he would stop. We tried it and it worked – except that it wasn’t the Dubrovnik bus and we weren’t sure where it was going, but the driver said that the Dubrovnik bus would be along in about 10 minutes. It was, and we got on it. The journey took about 2¼ hours and there were some magnificent views, stark grey mountains, little fishing villages way down on the coast, miles of vines and what seemed to be an enormous number of wineries as this peninsular is a very important region for wine. 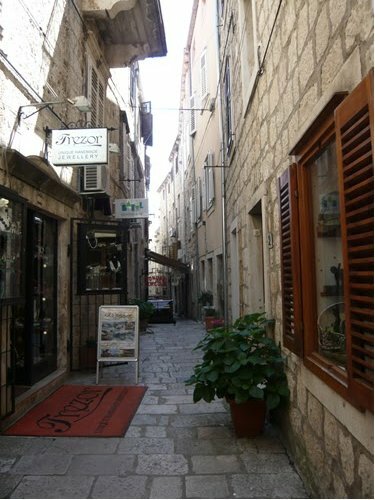 Dubrovnik is well worth a visit and inside the old town there is a main street lined with a variety of little shops and made up of very shiny stone and with many steep, narrow streets leading off it. It’s possible to pay to walk around the city walls, but as we had done that on a previous visit we just wandered around the town and down to the harbour where there were many boats ready to take people out on sight-seeing trips. We didn’t really have time to include that in our itinerary as we didn’t have a choice of times to get the bus back again. Initial enquiries about the buses gave us 2.15 as the return time, but to make sure we checked at the bus terminal as we arrived. Yes, 14.15 was on the printed timetable but we asked in the ticket office to make sure and were told 4.15. Decided to confirm with the driver who was still there and he wrote the time down for us – 1500. Utterly confused we did get ourselves back to the bus terminal in good time and saw a bus with a board on the front stating it left at 2.15 and arrived in Orebic at 5 o’clock. We soon realized where the extra ½ hour on the journey occurred – we stopped quite a number of times along the way for the driver to deliver packages to someone waiting for him to come along! To allow us to see a little bit more of the area we hired a car and drove to a lovely little hamlet, Loviste, at the tip of the peninsular. In one place along the route the main road was closed and we were diverted along the road by the sea – literally! Not a very wide road and only enough room to pass another vehicle if one pulled in to a gateway – the other side of the road didn’t have any verges, curbs or bollards and a slight error of judgment would mean a drop into the water! Leaving that road we went up over the mountain with the most beautiful views of some of the many islands along the Dalmation coast. The sea in the Adriatic is very clear and in all the places we have been to you can see down to the bottom, the water ranges in colour from aquamarine and turquoise to mid-night blue – never seems to show the full range in photographs! Having gone to the tip of the peninsular we had to come back the same way as most places have one way in and the same way back out. Made our way towards Dubrovnik and down to a very deserted little hamlet on the coast across the water from the Croatian mainland, though a little further down that coast the road runs through Bosnia for about 10 kms and you need to make sure your insurance covers you for that country. On our way back we made a stop at one of the many wineries where you can taste and purchase local wine ranging in price from 25 Kunas (about £3.20 a bottle) to 100 Kunas (£13) and then on to Trpanj where the ferry comes in, before making our way back up and over the mountain back to the campsite. There doesn’t seem to be very much in the way of wild life here, but we saw 3 snakes in gulley near the town and on another day there was one in the gutter by the footpath. On the more cheerful side we did catch a glimpse of a pair of golden orioles – a beautiful flash of bright yellow as they flew in and out of the trees along the road and the wild flowers everywhere are a lovely sight. Plenty of time to enjoy the beautiful view from our pitch and apart from a couple of days of wind and rain the weather has been hot and sunny. The walk down into the town is fine, but coming back is uphill and a bit of a struggle if the sun is too hot, however the walk doesn’t need to be on the road all the way as there are many narrow roads leading down to the lower road by the sea. Found a lovely little restaurant and enjoyed large shrimps fried with garlic and a bowl of chips! Good thing we had to walk up the hill afterwards – hopefully it got rid of a few of the calories! Oranges, almonds, figs and nesparro seem to grow in early everyone’s gardens and there are so many beautiful wild flowers which we don’t see in England. Ferries go regularly from Orebic to the town of Korcula on the island of Korcula which is a 10-15 minute trip and well worth it. We only visited the town itself which is on the level for the main part but on one side of the main street there are narrow streets of steps going up to the buildings on the hillside and on the other is a walled city, built on a hill, with many narrow alleyways leading off the main street, some with steps, some just steep, and with little shops and dozens of eating places everywhere. A really lovely atmosphere which is very difficult to describe! We felt very privileged to be invited by Duska (campsite owner) to a luncheon on Sunday to celebrate the birthday of her husband, Jani. A wonderful experience sitting with friends and family and some of the other regular visitors to the site. A real time of celebration with plenty of wine and schnapps along with platters of meats, canapés and potato salad, followed by goulash with what looked a bit like pasta but had the consistency of bread dumplings, then grilled meat, followed by cake with plenty of fresh fruit and cream. This was also accompanied by plenty of singing of what we took to be Croatian folksongs. Certainly something to be remembered for a long time. For the motoring enthusiasts amongst you its that time of year again !! When like minded motorsport fans begin planning their journey to Le Mans, France, for the 24 hours endurance race. For many its an annual pilgrimage, not just for the weekend, but for a couple of days either side. or perhaps this year, should we secure ourselves some creature comforts, and purchase a motorhome or a touring caravan from TC Motorhome & Caravan Centre in Herne Bay, Kent ? A number of the T.C.Motorhomes team are heading off to Le Mans for the weekend in June, in Motorhomes of course, and will be flying the T.C. Motorhome Flag .. why not come and say hello. Or Call Shane Catterick At T C Motorhomes On: 01227 289111. TC Motorhome &amp; Caravan centre, of sweechbridge road, Herne Bay have been awarded the “Sterling” Caravan Franchise by the Swift Group of Caravan & Motorhome companies. Yes thats right!. The swift group have appointed TC Motorhome &amp; Caravan centre, as their newest franchised Sterling Caravan Dealer. Alistair Larter, Caravan Account Manager At Swift Group Ltd, Confirmed His Delight, That One Of The Most Exciting, Award Winning Range of Touring Caravans, Sterling, Was Heading South, And Will Be Displayed Very Soon At The Brand New Showroom Facilities Of T C`s, Just Outside Herne Bay. Tony Chamberlain, Dealer Principle Of TC Motorhomes, (An Established Dealership That Already Has New Motorhome Franchises Which Include : Swift, Caravans International, Elddis, Adria &amp; Globecar Represented AT Its Location IN Herne Bay ) .. Was Pleased That The Companies Success Was Being Recognised By Some Of The Biggest Names In The Industry. He Added That The Success Of His Team In Herne Bay, Was In Large Measure Down To Their Collective Focus, On Delivering Customer Satisfaction , Quality Products, Be It New Or Used, And Value For Money. For More Information On The Range Of Sterling Caravans... Swift, Adria, Elddis, Caravans-International, Or Globecar Motorhomes , Contact Shane Catterick, Or Neil Kinsley At TC Motorhomes, On: 01227 289111, Or Visit Our Web-Site: www.tcmotorhomes.com.